He is doing fine. In nineteen days we go back up to Gainesville for his ex-rays to see how the bones are healing. He has no noticeable limp on one side or the other. When he stretches, both downward and forward, his motion is fluid and he doesn't seem to be in pain. I take him for very short walks five, or so, times a day on level ground. No stairs, no jumping, no playing, no running, no excitement. He has has a cushioned four-foot-square pen he stays in most of the time with the plastic cone ( cone of shame ) around his neck. The cone is to keep him from licking the wounds. This keeps them dry and to prevent infection. 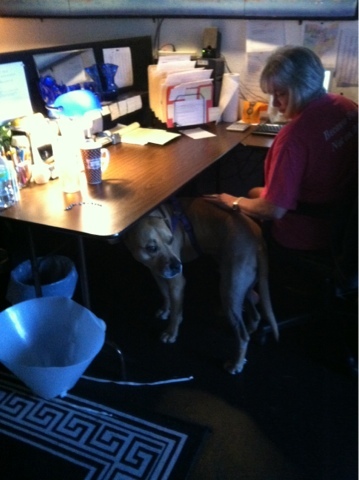 He gets to sit next to the girls in the office for short periods, cone less, for attention and his daily allotment of love. 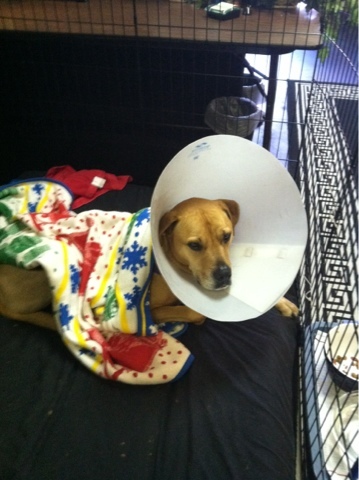 He has pain, anti- inflammatory and anti-biotic medications he is given throughout the day and night, with food. He has never been one to eat so many times a day so I have been plying him with chicken and ham chunks that also hide the pills. He has become wise to to this ploy and is beginning to turn away from the treats I uncharacteristically hand feed him at all hours of the day and night..
His hair is growing back from when he was shaved for the surgery. Some people say a dog and his human tend to look alike. I have a bald head, but this is taking that theory a bit too far. Of all the places for Nice to heal and be cared for, this small office, the loving women during the day, the quiet grounds around this small plaza; I cannot think of a better place.